Whether cartilage injury has been caused by autoimmune response, as in case of rheumatoid arthritis or due to some mechanical or chemical reasons as in case of degenerative arthritis or in fact some sport injuries, all cartilage injuries have one common reaction: inflammation of the tissue. Inflammation, or swelling spreads due to pro-inflammatory mediators including nitrogen monoxide (NO), IL-1, TNF-α and substances called prostaglandins. Inside the joint tissue, the amount of these substances is directly proportional to degree of cartilage damage. That means that inflammation and cartilage damage may be reduced by reducing the production of these substances. ZGLOBEX ® DoloAktiv® is a natural product that has target action against inflammatory processes inside the joints. Active ingredients of ZGLOBEX® DoloAktiv® help block pro-inflammatory substances’ action that are connected to swelling and joint tissue destruction. In this way, ZGLOBEX® DoloAktiv® targets the sole cause of the problem, helps prevent cartilage and other joint tissue destruction, reduces pain sensation and improves joint mobility. 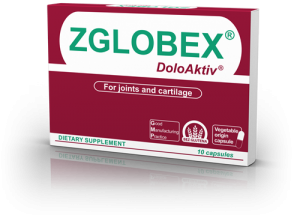 The components of ZGLOBEX ® DoloAktiv® are derived from all natural sources via the latest and most innovative technologies and act complementary against the cause and symptoms pf arthritis. Dry harpagophytum root extract or devil’s claw (lat. Harpagophytum procumbens) that is contained inside ZGLOBEX DoloAktiv® product is traditionally used for relieving symptoms of rheumatoid arthritis and osteoarthritis. This extract contains high doses of phenylethanoid derived glycosides including harpagoside that has a powerful anti-inflammatory, anti-rheumatoid and analgesic effect. Latest clinical studies have shown the efficacy of harpagoside in arthritis symptom relief and an anti-rheumatoid-like effect that can be compared to those made by COX-2 inhibitors (rofecoxib). Pinus pinaster, or sea-side pine tree has a high content of proanthocyanidins that have a dual effect: powerful anti-oxidative and anti-inflammatory effects. Research show that the anti-inflammatory effect is cumulative, with the effect gradually increasing through time. Proanthocyanidins inside ZGLOBEX ® DoloAktiv® inhibit both COX-1 and COX-2 enzyme effects that cause inflammation, swelling, pain and cartilage damage. By inhibiting these enzymes, DoloAktiv® protects the cartilage and reduces existing symptoms. Added benefit of these substances is their action on blood vessels: they improve the circulation and have an antiaggregatory effect such as that of aspirin. All natural ingredients, optimized doses and a controlled component distribution in ZGLOBEX® DoloAktiv® guaranty safety in long term use, with no adverse effects. ZGLOBEX® DoloAktiv® is produced using a patented technology thus increasing the efficacy, and reducing adverse effects of standard therapy multiple times over. ZGLOBEX® DoloAktiv® has anti-inflammatory, immuno-regulatory and analgesic effects, and it was also shown to possess hepatoprotective effect that is especially important for patients that are due to illness severity are forced to be on long and aggressive therapies. In this fashion, it reduces basic symptoms of joint illness: pain, limited movement, stiffness in joints, as well as the inflammatory symptoms: swelling and redness, thus preventing further complications such as deformities and joint immobility. Effect is carried out on molecular level which has been proven in multiple clinical studies. Reduces IL-1 levels, which is greatly increased in inflammatory reactions, thus reducing immunity response intensity. Inhibits inflammatory factor synthesis such as prostaglandin ε2 and leukotrienes. ZGLOBEX® DoloAktiv® reduces the concentration of substances involved in inflammatory pathways thus reducing inflammation, pain and stiffness, and stops further degeneration process and other illness consequences. It is recommended for symptoms of osteoarthritis and rheumatoid arthritis where it significantly shortens episodes and intensity of illness progression, in muscle and joint pains, and as a long term protection from cartilage damage. In persons with initial symptoms of arthritis- DoloAktiv® acts protectively on cartilage, relieves existing symptoms and stops the progression of illness. In persons with advances symptoms– DoloAktiv® increases the effect of non-steroidal anti-rheumatic medications (NSAIL) so their dosage may be lowered. In this way it protects the gastric region from NSAIL adverse effects. In persons suffering from rheumatoid arthritis – ensures new healing approach to joint maladies that is complementary to the existing therapies. Combines well and increases the effects of methotrexate. In this way, it shortens relapse periods and progressive damage. How to use: 1-2 capsules a day.